We have updated the free View Rotation macro so that it now works with 3D models. This macro shows the current rotation (in degrees) for each of the 8 standard views. 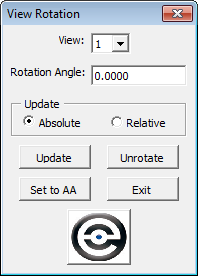 The user can change the view rotation to any keyed-in angle value, or unrotate the view. Using the Absolute option changes the rotation to exact value specified in the rotation text box. The relative option will add the value in the rotation text box to the current view rotation. 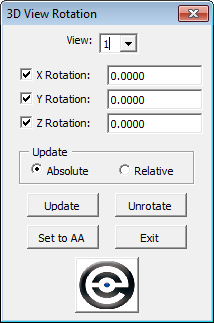 The Set to AA option will use the current Active Angle setting for the rotation angle. When the macro is started with a 3D model active separate X, Y, and Z rotation settings are available. Open our MicroStation freeware downloads page to get this and other free macros.